Experts in the aviation industry have expressed surprise over the survival of a teenager stowaway, Daniel Oikhena, who hid in the wheel well of Arik Air aircraft used for flight W3 544 from Benin Airport to the Murtala Muhammed Airport, MMA, Lagos. It will be recalled that the teenager apparently sneaked into the aircraft main wheel well at the Benin Airport after he had beaten security checks at the airport, but he was arrested by Arik Air personnel and handed over to Federal Airport Authority of Nigeria, FAAN, security upon arrival at the Murtala Muhammed. Airport, Lagos when he came out of hiding. Speaking on how Daniel could have survived at the nose wheel of the aircraft, an aviation expert and Managing Director of Belujane Consult, Mr. Chris Aligbe said there was no expert in the aviation industry that could give a satisfactory explanation to what happened, stressing that the boy’s survival was indeed miraculous. He further noted that the boy’s survival could be as a result of the short distance that the plane flew, noting that from Benin to Lagos airport was just 35 minutes of flight time. He said that the aircraft did not ascend high into the sky as it only flew at 10,000 feet above sea level. Aligbe, however, stressed that if the distance was a long haul flight, like from Lagos to London, the teenager would have frozen to death, stressing that the higher an aircraft ascends into the sky, the cooler the nose wheel apartment becomes. He said that was the major reason why people that stowed away from Lagos to other parts of the world are found dead upon arrival at their destination. In such cases he said, the airline staff often found the corpses of such people on landing. Also speaking, Chairman of Aviation Round Table, ART, Captain Dele Ore, explained that the boy survived because of his size and more so, the flight was for a short distance which was not more than 10,000 feet. Ore said based on the small size of the boy, he was not crushed to death on the wheels where he hid himself. The ART chairman further said had the flight been a place like United States of America, the plane would have flown above 25,000- 35000 feet, the boy would have died in five minutes because the place he hid himself was not a pressurized area. 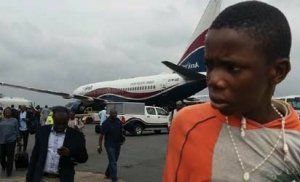 Meantime, De Raufs, a volunteer group extolling the virtues of Ogbeni Rauf Aregbesola, Governor of Osun State, has volunteered to sponsor 15-year-old stowaway teenager, Daniel Oikhena, who hid in the tyre compartment of Arik Air flight from Benin to Lagos. In a statement signed by the Director General of the group, Comrade Amitolu pootu, the group is ready to give scholarship to Daniel up to university level and help him realise his dream of travelling by air legitimately. pootu said: “Genius and ambitious citizen of our country must not be suffocated on the alter of political and bureaucratic enforcement. The little boy’s ambition should be nurtured through qualitative education, and the group is ready to give the boy all the necessary support to make his dream a reality.